An MP and her newborn baby found themselves perilously close to the shooting in Parliament’s Centre Block Wednesday. 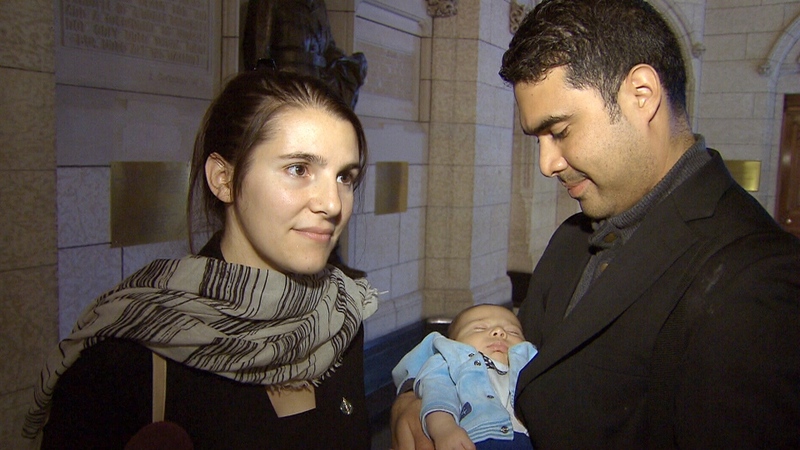 NDP MP Lysane Blanchette-Lamothe, who represents the Quebec riding of Pierrefonds-Dollard, had been in the NDP caucus meeting, but stepped out to the lobby to breastfeed her newborn son, Evan, who is almost two months old. Within minutes, the MP says she found herself just a few metres from where gunshots suddenly began to ring out. “We didn’t know where to go. It seemed that (the gunshots) were everywhere,” she told CTV’s Katie Simpson Thursday, not far from where the incident occurred. Blanchette-Lamothe says she ran with her baby into an alcove that was once a telephone booth, sat on the floor and waited for the shooting to stop. She tried to stay calm, she said, so that she could keep her son calm, to ensure he didn't start to cry and draw attention to them. But baby Evan didn’t seem to notice a thing and just kept feeding, she says. “He was really good. He didn’t yell or cry. That was the only thing I thought about: he needs to be calm to make sure we can keep hidden,” she said. Within minutes of the gunfire ending, security agents found Blanchette-Lamothe and ushered the MP and her colleague into a room, where she waited out the rest of the lockdown. They spent the rest of the day in the lockdown and Blanchette-Lamothe says she wasn’t able to get home until about 10 p.m.
Are our soldiers in the crosshairs? After attacks, is Canada safe enough? NDP MP Lysane Blanchette-Lamothe, left, says she was breastfeeding her two-month-old son as shots went off in Parliament Hill.